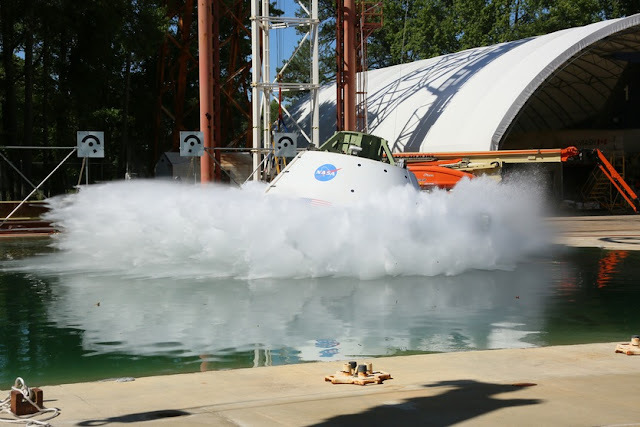 A replica of the Orion spacecraft was pulled back like a pendulum, swung, released and plunged into a 6.1 meter deep pool during testing at NASA’s Langley Research Center. Securely seated inside the capsule, crash-test dummies wearing modified Advanced Crew Escape Suits are being put through their paces to help engineers understand how splashdown in the ocean during return from deep-space missions could impact the crew and seats. Each test in the water-impact series simulates different scenarios for Orion’s parachute-assisted landings, wind conditions, velocities and wave heights the spacecraft and crew may experience when landing in the ocean upon return missions in support of the journey to Mars.